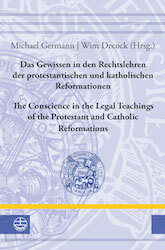 Wim Decock, a CSLR Fellow and Assistant Professor of Legal History at the Universities of Leuven and Liège in Belgium, has co-edited a book with Michael Germann, Conscience in the Legal Teachings of the Protestant and Catholic Reformations, (Evangelische Verlagsanstalt, 2017). "The essays collected in this volume investigate the role of the religious reform movements in the transformation of the Western legal tradition, especially regarding the notion of conscience," Decock says. "Cross-disciplinary research by legal historians, theologians, and philosophers on the teachings of Lutheran, Calvinist, and Roman Catholic jurists and theologians are brought together for a comparative perspective."